Simon Moroke Lekgetho was self-taught, despite lessons in drawing taught at the occupational school in Middelburg, Mpumalanga. On completion of his training, he moved to Pretoria where he worked as a clerk for the Provincial Administration. While there he obtained his matriculation certificate through correspondence. Apart from books on drawing and painting techniques which he acquired for private study, he also enjoyed guidance in painting from Walter Battiss (1906–1982). He started to paint seriously in 1952 and also taught art at his studio, 1216 Fortuin Street, Lady Selborne. 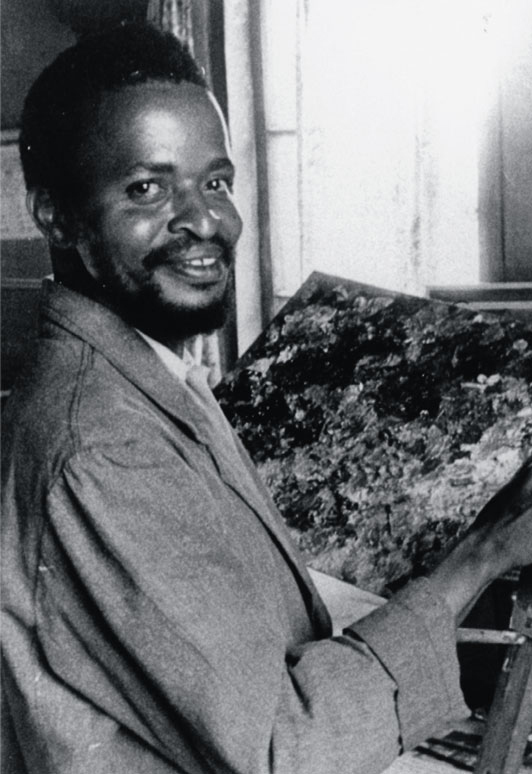 He painted portraits, still-lifes, landscapes and wild-life as well as Bushman rock-painting inspired compositions. His still-lives are unique. Unlike the vanities to which they relate, Lekgetho emphasizes healing, rebirth and continuity and not the transience of existence. Moreover, his use of chiaroscuro intensifies the symbolism of these pieces. The dark backgrounds contrast the light foregrounds where the divination objects silently predict what is to ensue. In Still-life with Sangoma’s bones and other objects (1964) (plate 111) the incense (mphephu) has been lit. While the smoke rises, a butterfly, mid-way in the pictorial space, hovers downwards between the objects and the smoke. The butterfly signifies the spirit of the mphephu and is ‘a sign of the humble messenger who brings peace and happiness’.1 These still-lives consisting of calabashes, gourds, herbs, grinding stones, incense, divination dice, beads, shells, knuckle bones and stones give a significantly African dimension to still-life painting. Author communication, David Phoshoko, artist and traditional healer, 26 June 2005. Born Schoemansville near Hartebeespoort Dam 1929; died Ga-Rankuwa, near Pretoria-Tshwane, 1985. Training No formal art training. Exhibitions 1957 onwards: Regular solo shows in Pretoria. 1959: Royal Society of British Artists (RBA), London. 1993: Land and Lives, South African Arts Society, Pretoria. 1997–1998: Land and Lives, Johannesburg Art Gallery; Nelson Mandela Metropolitan Art Museum, Port Elizabeth; Tatham Art Gallery, Pietermaritzburg; Iziko South African National Gallery, Cape Town. Collections Johannesburg Art Gallery; South African Reserve Bank, Pretoria; The Bantu Corporation of South Africa, Pretoria-North; Sanlam Art Gallery, Bellville, Cape. Lekgetho with one of his paintings in his studio. Source: Die Vaderland, 11 Maart 1958. Photographer unknown.